Quail- best use for quail eggs? Hi Clare and welcome. I can't really help you here. Bobquail will I am sure have lots of ideas. However I am seriously thinking of getting some quails myself, so shall be watching this thread with interest. I already have hens and ducks. How many quail do you have? How lovely, quail are such cute little things. I expect Mike will be along later to help out. As Danuta and TA have said, we have the same situation with more quail eggs than we know what to do with. We try to sell some spares to friends and colleagues but that only gets rid of a dozen every week or so. It always seems a bit extravagant to use them in cooking or baking but when you're overrun with the things, it's the only sensible solution. At the weekend we sometimes have a fried breakfast, with 6 quail eggs filling in for one hens egg, so we have a fried egg with 6 tiny yolks in it. We also use the eggs in baking, so that gets through them fairly quickly. We also have a decent supply of pickled eggs now - whenever we get a glut we tend to hard boil a pan full, peel them and stick them in a jar of vinegar. To freeze whole eggs, break them into a bowl and beat a little to blend. Tip into a freezer bag or airtight plastic container and use within three months - freeze them in small batches, as these will be most useful, and be sure to label the number of eggs that go into each freezer bag. Whites and yolks can also be frozen separately. Egg whites just need tipping into freezer bags, whereas egg yolks need a pinch of salt or sugar beaten in (depending on whether they'll be used for sweet or savoury dishes later). This will stop them from thickening too much upon freezing. Defrost frozen eggs in the fridge overnight and use them straightaway. Well done Mike! That's a very useful post. I always thank the hens and ducks for their eggs, but I must say I have never apologised to them. Mike, I might be asking your advice soon on the housing and keeping of quail. My girlfriend knows more about the animals than I do - I usually feed them and talk to them, but if anything goes wrong then it's her turn to deal with them. Since quail fly, they will need to be in some kind of hutch rather than free range. They tend to flap and jump instead of flying properly, so they'll need a few feet of headroom and not a full sized aviary, but of course if they get out then they could easily fly over a wall or fence and escape - we've had first hand experience of that and have had to go into neighbours gardens or chase birds along the alleyway behind the house. I don't seem to have any photos of our current setup but the new hutch is a bit bigger so we had room for more birds. Yes- a hutch arrangement is best- if you let them lose it's like chasing sparrows and a net job for sure. We have 4 Japanese (brown quail) and 4 Texan White- babies. 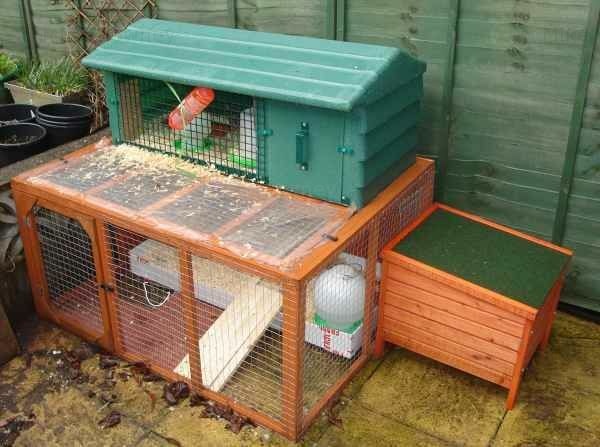 A rabbit/guinea pig hutch works well- one side is bedded with shavings - just a scattering-the other is wired at the base so they can have access to grass and be moved around the garden. They don't nest or roost like the chickens- and look entertainingly surprised each time they pop an egg (which is frequently). We feed ours on scraps plus minceed pellets/corn mix (donatede by thechooks). They were on chick crumbs which suited them but apparently has something in not for consumption. They might not have the personality of chickens but they make a fantastic starter bird because they are fox proof and put themselves to bed!! They are hard to breed from- probably best to buy young birds to start with. Our birds make an amusing 'whistling kettle' noise when they are laying an egg. If we are outside and hear it, we know it means there's a fresh egg to collect. You really need an incubator to breed quail - they are fairly dumb birds and keep forgetting to sit on their eggs. Our local feed merchant sells proper quail layers pellets. It has higher protein than normal poultry pellets. If you have very young chicks, I think it's a good idea to have a higher protein food - if quail pellets aren't available then something like chick crumb should be suitable. As well as the pellets, we regularly give them fresh greens from the garden, including grass and dandelion leaves. They also love courgette and cucumber, going mad over them, pecking at the softer flesh until there is just the green rind left. There's something really satisfying watching an animal enjoy food like that. Either satisfying or amusing, I can't always tell the difference. I think next Spring, I shall look into getting some quail. I think I would like them.